Last week I wrote about books I've recently finished reading. I always feel a little more comfortable doing that, because when I talk about books I haven't read yet, there is always that off-chance that I'll accidentally recommend something I really wish I hadn't. But there is something so compelling about my TBR pile, something almost magical, and I love sharing it with you. I read about this book on goodreads, and then promptly forgot the title. I couldn't get the premise out of my head, and so I kept trying to google it. It was about a witch. In New York, I thought. And it wasn't YA, which is odd for me, so the author wasn't familiar. The Witch of New York? Nope. It seemed like it had the word little in the title, or some synonym of it. The Little Witch of New York? The Witch of Little New York?? Dang. Why was I even thinking New York? Wasn't it Italy? Ack. It was hopeless. Fifty years in the future I was going to be on my deathbed, regretting that I hadn't written this stupid title down. The Little Witch of Italy? And finally, in one glorious burst of light, I remembered. 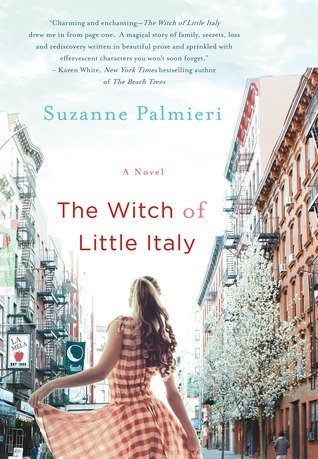 From goodreads: In Suzanne Palmieri’s charming debut, The Witch of Little Italy, you will be bewitched by the Amore women. When young Eleanor Amore finds herself pregnant, she returns home to her estranged family in the Bronx, called by “The Sight” they share now growing strong within her. She has only been back once before when she was ten years old during a wonder-filled summer of sun-drenched beaches, laughter and cartwheels. But everyone remembers that summer except her. Eleanor can’t remember anything from before she left the house on her last day there. With her past now coming back to her in flashes, she becomes obsessed with recapturing those memories. Aided by her childhood sweetheart, she learns the secrets still haunting her magical family, secrets buried so deep they no longer know how they began. And, in the process, unlocks a mystery over fifty years old—The Day the Amores Died—and reveals, once and for all, a truth that will either heal or shatter the Amore clan. I'm absolutely enjoying this book so far. It's a sweet, sweet story. I'm not too far into it yet, so take my recommendations with a grain of salt. I went to the library yesterday, and to my surprise, most of my TBR books were waiting for me there. I've either got a lot of reading to do in the next month or a lot of sorting out to do. 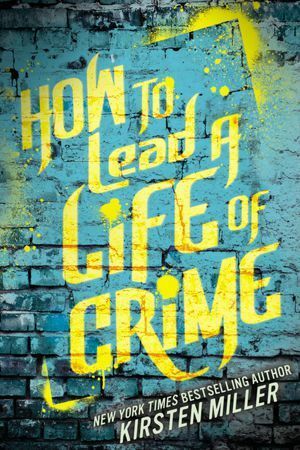 How To Lead A Life of Crime by Kirsten Miller. From goodreads: A meth dealer. A prostitute. A serial killer. I'd seen this book before Sabrina recommended it, but was utterly turned off by the description. Why would I want to read a book that seemed to be glorifying meth dealers, prostitutes and serial killers? But after Sabrina's review, I picked it up again, and this time I read the back cover. "Joi's clearly been brought here to die. I thought I could take whatever Mandel threw at me. I'd endure the beatings and battle his Wolves. I'd make him believe that I was his masterpiece. Then I'd graduate and destroy the academy. I thought this time, I was willing to do anything. Now Mandel will know that it's all just an act. Because there's one thing that I will not do. Not even to save the world from a monster. I won't let Joi die." Now THAT is a premise I can wrap my brain around. I'm very excited to give this one a try. Several of the goodreads reviewers warn that this is a very gory book, and definitely not for young YA readers. I won't say much about this one, because it was on my list last time too, and I'm only finally getting to it. 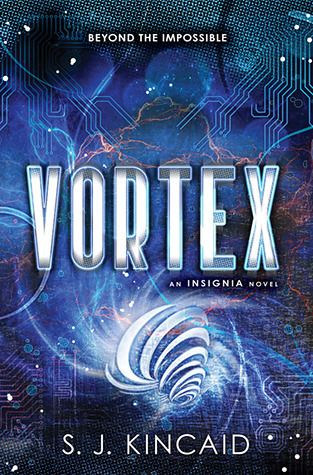 It's the sequel to Insignia, which I loved. It is YA science fiction--think Orson Scott Card but snarkier. Yep. I still haven't read it. It's been on my list for at least a year. It's different this time though, because I actually have the book in my hot little hands. I'm a little scared to read it, because everyone says it will make me cry. I hate that in a book, but people tell me it is worth it. So here's a couple that aren't actually in my pile, but which will be soon. Who knew it just came out a few days ago? Not me. Good thing I checked, because I hadn't heard anything about it. I'll probably be buying this one. It's the last book in the Fire and Thorns Trilogy which I love with every piece of my heart. I nearly forgot to mention that a few weeks ago I entered a goodreads contest and won an ARC for Slayers: Friends and Traitors by C.J. Hill. It's the second book in the Slayers series. It was so exciting to get an unexpected book in the mail, and I love C.J. Hill/Janette Rallison. Yay for me! It comes out on October 15, so if you hurry, you have just enough time to read the first one. Are there any great possibilities in your TBR pile? Well, so far tonight I've started and discarded posts on the new school year and how learning is where you find it. And about money management (because my absolute favorite budgeting tool, aptly named, You Need A Budget, is on sale if you have a Steam account). I also thought about writing about Netflix - uh, only reruns for me right now until I can figure out a way to access Falling Skies. Or what I'm reading - all rereads currently. And I finally settled on asking all of you a question. When you think of all the things you've written, what are you most proud of? I'm kind of in a place in my life where I desperately need to write, and yet there are a lot of things that, even if I find the time to write, run around all distracted-like in my brain. So, I started trying to think back to those times when there was that awesome spark and writing was good. It's funny that the things that first came to mind aren't the best things I've ever done. Or the most important things, like finishing my thesis - which was a relief, but I'm not sure I was particularly proud of it. Or even the most recent. In the end, I think it was a story I wrote when I was 10. How funny is that? But I can still remember the absolute magic of it. That feeling of a world opening up in front of me that I never knew existed before. I don't know where that story went to, but I'd like to think that if I read it now, it would still be perfect. So, what are you most proud of? I grew up on Heinlein. I've read Arthur C. Clark, Le Guin, Card, Asimov, and the other giants in science fiction. I hesitate to say that, because as much as I've read science fiction, they aren't the stories that made me a writer. Don't get me wrong. I love the bigger than life situations, the science as magic, but generally speaking, for me science fiction is too dry, to dependent on an idea to really sink it's teeth into amazing characters. But I've been waiting for a show or a book that will change my mind. Falling Skies is the science fiction show I've waited for my whole life. I want to write about it analytically, and show how to do this with your own writing, but I'm too much of a super fan to talk about it with that much distance. But I can tell you what makes me go I LOVE IT SO MUCH! I'll even try to do it without too many spoilers. First of all, the situation. The show starts almost a year after the aliens came. The Skitters destroyed all the military, all the weapons, the major cities, and those humans who survived are so busy surviving, they haven't even started resisting yet. Enter the hero. Tom Mason. 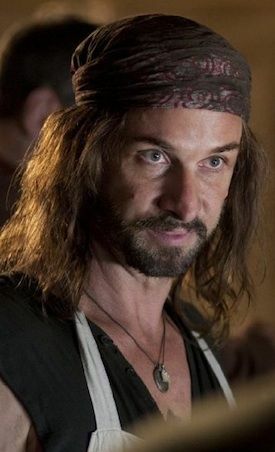 Yup, that's Noah Wylie, and he's done amazing work on this show. Tom Mason used to be a history professor with a wife and three sons. His wife was killed by skitters, and his middle son, Ben, was taken and harnessed by the aliens. Mason just wants to protect his family and kill the monsters. He's a hero, because he's is the best of humanity. He's a smart hero, and he uses what he knows about history, about the civil war, to fight aliens. He's a leader, and he will never stop fighting. He will never give up. His first goal is to save his son, and when they find a nest of harnessed kids, he's about to do whatever he can to save them. Why this works: Tom Mason isn't a perfect character, but he's a character that has proven can be trusted, and that you want to root for. Because you have to root for him. The harness concept comes straight from Heinlein. What makes it different, is that the aliens put a harness only on children or teenagers they find. These harnessed kids are still human, but they are under the alien control. They're well treated, but used as slaves. The harness changes them too, so even if ( Spoiler alert...when) they learn how to take it off, the child will never be the same. Why this works: First of all, it lessons the terrible fear when a child is in danger. If an alien surrounds, say Mason's youngest son Matt, you know they won't just kill him the way they would a grown up. This gives them plausible time to save, or not save, someone. Second, a harnessed kid will never be the same. Even if the harness is 'somehow' removed, being harnessed is forever a part of their identity. The change is fascinating, scary, and has far reaching consequences. Did I do that without too many spoilers? Yes? Well, here's one I missed. I wish I could tell you how cool and smart and scary this show is. I wish I could tell you about the twists and the love stories, and the incredible amazing way the writers keep hope flourishing throughout the story. It's a post apocalyptic story, written in hope and beauty. There are times when I turn it off, and watch above me for Aliens to jump from some high spot in my ceiling, and there have been times when the show ends, and I close my eyes and try to remember all of that beauty. I'll tell you to watch it because it will inspire and entertain you, but that's not enough. 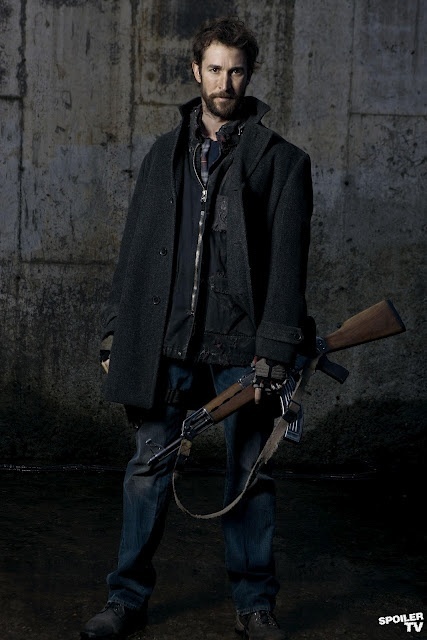 The reason you have to watch it, is because Falling Skies has my favorite character ever written. Pope is a character which humanity would have been better off, if he had died when the aliens came. Pope watched a girl get raped and not done anything to stop it. In fact, he laughed. He's stolen, killed, and tortured for fun. He is slime, and yet, he is articulate, fascinating, and so well crafted. He's one of the darkest characters I've ever seen, but somehow they've redeemed him. I mean you don't trust him obviously, but you can't stop watching him either. I hate him, and I adore him. I cheer when he comes on screen, because he can do anything. Literally, he will always prove me wrong, and fail my expectations. For good or for evil. He will walk into death laughing, and he will survive at any price. He is a cockroach, a worm, and I'm just glad he's not on the Alien's side. He is going to save the world. This awful human being, the worst humanity has to show, will be the reason they find a happy ending. I can promise you that right now. He is a fascinating light and dark character, and the actor who plays him is brilliant. That's what Falling Skies is. 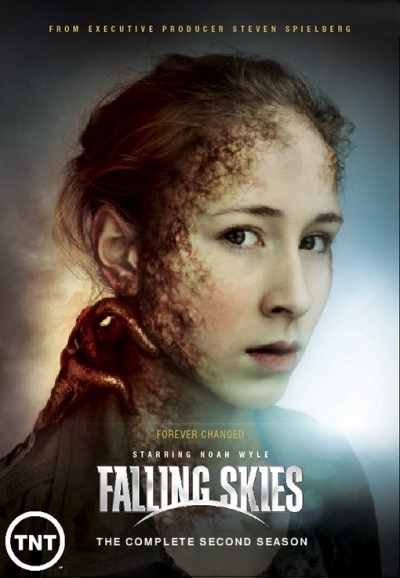 Falling Skies paints with both light and dark colors. It shows equal helpings of beauty and horror. Throughout the story they make sure you know that humanity is worth saving, and they also show that at any point, humanity could be snuffed out. I love it. It's already made my writing better. I think Heinlien would be a fan. What have your great summer reads been? In my reading posts, I typically throw a zillion titles at you, lumping the books I've loved and hated and the books I haven't read yet all into one big pile for you to sort through on your own. Since I have an extra week to post, I'm not doing that this time. I'm only telling you about the books I've already read and enjoyed. I'm a little embarrassed by the easy-readingness of these books. Deal with it Mom*. 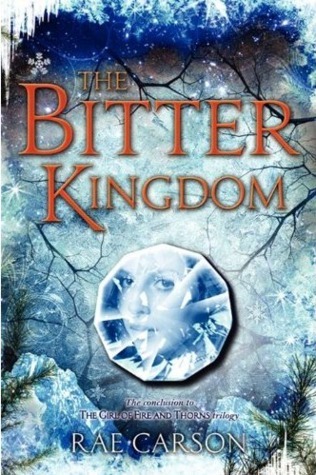 From amazon: A castle that is constantly rearranging itself, and a young royal family sworn to protect it... Celie, Rolf, and their beloved Castle Glower are back in this exciting sequel. I read this one out loud with my son out on the hammock on a sunny day with a cool breeze, so I doubt it's possible for you to enjoy it quite as much as I did, but you'll love it, especially if you share it with that 8-12 year old in your life. From amazon: One hundred years before Ender's Game, the aliens arrived on Earth with fire and death. This is the story of the First Formic War. Victor Delgado beat the alien ship to Earth, but just barely. Not soon enough to convince skeptical governments that there was a threat. They didn’t believe that until space stations and ships and colonies went up in sudden flame. I listened to this one on audio. I enjoyed the first book, but I was frustrated by the sparse mentions of Mazer Rackham. This second novel fixes all of that. It's not Ender's Game, by any means, but it's still a great read. I listened to this on audio as well, and the reader was great. Not "to die for" but apparently that was the reader of book 2, not the reader of this one. Oh well. Still good. I've always enjoyed this series, but haven't adored it like I adored the first 3 City of Bones books. However, the ending of this book was satisfying, and I'm very glad I finished it. Susan has recommended this book to me several times, so I finally bought it and read it this summer while we were on vacation. I enjoyed it. In fact, I haven't swooned over a book like this since Twilight. The one thing this book has going for it over Twilight is stronger characterization. The heroine has a strong personality, and the hero is swoon-worthy. There were problems with the book--mainly characters overreacting to small things and plots that didn't develop fully enough before twisting, but I look forward to more books by this author and in this line. Welcome to Guards! Guards!, the eighth book in Terry Pratchett’s legendary Discworld series. Long believed extinct, a superb specimen of draco nobilis ("noble dragon" for those who don't understand italics) has appeared in Discworld's greatest city. Not only does this unwelcome visitor have a nasty habit of charbroiling everything in its path, in rather short order it is crowned King (it is a noble dragon, after all...). How did it get there? How is the Unique and Supreme Lodge of the Elucidated Brethren of the Ebon Night involved? Can the Ankh-Morpork City Watch restore order – and the Patrician of Ankh-Morpork to power? I was promised that Guards, Guards was the perfect jumping in point for the discworld series, and so I finally took the leap. It was lots of fun. I'm not a discworld aficionado yet, but I'll definitely read another one. What should I read next? From BooklistThe stakes are not only higher but also personal in this third Heist Society novel. Teen criminal mastermind Katarina Bishop gathers her fellow con artists to help one of their own, W. W. Hale the Fifth, when Hale’s wealthy tycoon grandmother dies suddenly—and mysteriously—leaving control of her billion-dollar corporation to underage Hale and the family’s greedy trustee lawyer. This time Kat’s not after cursed jewels or stolen paintings but the original will—even if it means losing Hale in the process. I adore Ally Carter, partly because I love a good spy flick, but I am usually underwhelmed by spy books. I'm often disappointed by the lack of characterization and character growth. This is a spy book you can get through in a few hours, without needing to keep notes to keep track of the story. And this book was particularly good because the characters grew and changed and had cool backstories. *This is a quote from my soon to be published book Alchemy. Sheena's character, Sam, says it at one point. You'll probably be reading it again, so now you're in the know.